Anyone can learn how to be a leader. Children can develop leadership skills as early as 2 years of age, Psychology Today reported. During preschool years, kids can learn how to delay gratification and communicate nonverbally and with influence. When a child enters elementary school, he or she has the opportunity to lead student projects or serve as a teacher’s helper. Sports, such as martial arts, also tap into kids’ leadership potential, providing students with similar experiences. Youth sports often help children develop teamwork shills, increase self-confidence and build a competitive nature. All of these traits feed into a successful leader. In martial arts courses, a student could serve as a leader by displaying mastery of the material and showing others how to learn a particular technique. Fellow students may look up to the individual, which encourages a positive feedback loop. Part of being a leader is having a “can-do” attitude, Kidz​ ‘n Power, a parenting resource, reported. Instead of seeing a task as a problem, he or she sees it as an opportunity to learn. Leaders also prevail and persevere when times are rough. 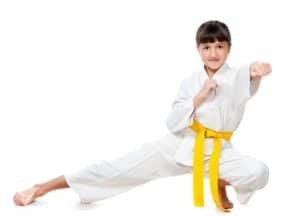 Martial arts courses provide children with the prime space to develop leadership skills.